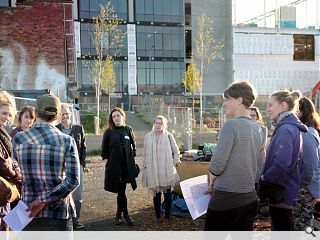 Fountainbridge residents and students are being invited to collaborate on the design and build of a canalside rest during a day-long design and build event facilitated by Here + Now CIC. The #SpaceToSit public realm initiative will see improvements made to a footpath along the Fountainbridge Canal through the installation of handmade furniture which will be left in-situ through July. 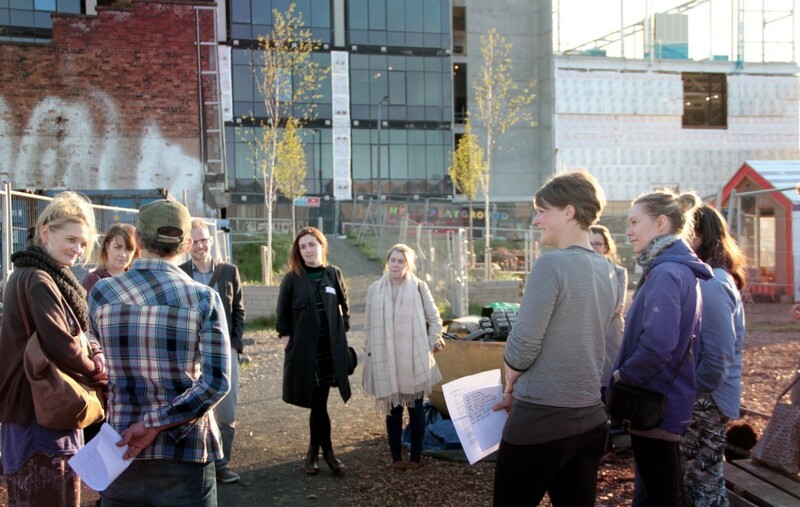 Thereafter the seats will be installed at other potential and community projects in stalled space development sites around the city as a massive regeneration programme around Fountainbridge continues. Here + Now received a chairman’s award for architecture at Wednesday night’s Scottish Design Awards. This here iz wit a cannae stand. Aw this 'community' stuff being pushed doon oor throats by thu liberal agenda. The community this. Thus community that. Thu community collaborated oan this design. The collaborated oan that design. Ur the community engineers? Ur they architects? Ur they product designers? Wits that -- naw? So they didnae acshully collaborate on anyhing. Wit they did wiz come along tae a 'workshop' ur a 'charrette' organised by some lefty think tank an payed fur by muggins (that's you an me) where they gote a wee name badge, a cup ae tea an a biscuit and felt aw important becoz they got thur picture in the papur. It's aw this inaction and meanderin aroond in circles an patronising lefty community activism which isnae acshully aboot thu community but aboot being seen tae be 'inclusive' which gets ma goat. And di thu community sk fur plastic panels oan thur new builds? Did they ask fur aw the white rendered, zinc-clad architecture? Did they ask fur princes street's beautiful builds tae be knocked doon fur concrete modernist replacements? Naw. Then why did ye dae it? And guess wit, fountainbridge will turn oot how the powers that be decide it will. Blocky, soulless wae no a hint ae beauty in sight. 0 Points: Nonsensical, repetitive ramblings, that make little sense whilst written in poorly constructed, "vernacular" text. 2 Points: "concrete lovin' brigade" / "lefties"
1 Point: "Concrete modernism". / "Modernist concrete ideals"
Just three points today from this rant. Community lead design & build, well thats a non sequitur n a half. So its all designed and through planning, in masterplan at very least. But we give the silly sjw's a seat for a month to appease them. Hats off to the project team for Here + Now CIC ve enabling works like a boss! Always enjoy a Big Chantelle ramble. Imagine if there actually was a lefty liberal conspiracy in how our built environment was planned and designed? What a world we would live in. What. A. World.